The Jubilee Macaw is not only beautiful, but has a double dose of the gentle, good-natured Green-winged Macaw! The Jubilee Macaws are a cross between a Harlequin Macaw (hybrid) and a Green-winged Macaw. With the Harlequin Macaw (having a Blue and Gold Macaw and a Green-winged Macaw for parents) you have a macaw that is a real beauty and good natured. Crossing the Harlequin Macaw with the Green-winged Macaw can make for an even more affectionate, energetic, and attractive youngster. Hybrid macaws are bred for color. The Jubilee Macaws are second generation hybrid macaws. Because they are a mixture of more than one type of macaw, the offspring are influenced by the traits and characteristics of both of its parents. Father's have the dominant gene, so this will generally influence the offspring's coloration and overall appearance. The Jubilee Macaw inherits its gorgeous coloring from these two striking parents, and is strongly influenced by the double dose of Greenwing. The behavior and temperament of hybrid macaws are more unpredictable and uncertain than the coloration. Jubilee Macaws can all be good "talkers" as are the parents. If handled by a variety of people and by both sexes when young, they will tend to be friendly to others rather than to just one person or one gender. However with every macaw, as with people, will have their own personality. But they can be a very affectionate, inquisitive, and fun pet that is beautiful. The Jubilee Macaw is a second generation hybrid macaw. It is a cross between a Harlequin Macaw hybrid and a Green-winged Macaw Ara chloroptera. The breeders of these youngsters call them "Jubilee Macaws", as they could find no other know common names assigned to this hybrid up to this time. Both parents of the Jubilee Macaw contribute to the striking colors of their offspring. Because the father's have the dominant gene, this will influence their final appearance. The father of these youngsters is the Harlequin Macaw. Even still, you can see a bit of a difference in the final coloration. Some of its characteristics influenced by the Green-winged Macaw are that it can be a large bird, with the head and beak shape more typical of the Green-winged. A green back with a bronze cast is from the influence of the Harlequin Macaw. A full sized macaw, they can get over 2 lbs. Lengths up to 86 cm (34 inches). A roomy cage is required unless the bird is to be let out for extended periods. Many birds can spend most of their time on a play pen or parrot perch. They eat a variety of seeds, nuts, fruits, commercial pellets, as well as the same nutritional foods humans eat. They eat a variety of seeds, nuts, fruits, commercial pellets, as well as the same nutritional foods humans eat. 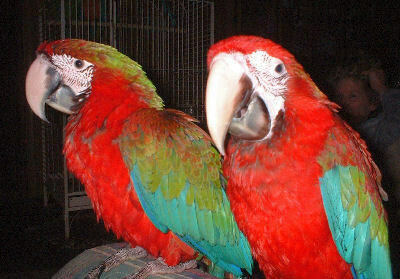 See About Macaws: Housing and About Macaws: Care and Feeding for more information. The Jubilee typically takes on the natural docile side of the Green-winged with some of the natural clownish personality of the Harlequin Macaw (the word harlequin is defined as 'clown'). No visible differences in the sexes. These birds are occasionally available and are expensive. There are more and more macaw breeders however, so finding these macaws for sale becomes easier as they become more common. We bought these 2 baby's from the breeder and they are the mostwonderful additions to are home.